George Armstrong Custer’s Model 1865 Spencer Carbine is up for auction with Heritage Auctions. It was part of on of the largest private collections of Custer artifacts ever put together, and the bidding starts at $25,000. The Spencer Carbine is an early lever-action black powder rimfire rifle, originally chambered in 56-56 Spencer, with a magazine capacity of seven rounds. The magazine tube is located inside the buttstock and the hammer must be manually cocked. At the time of its introduction in 1860, it represented an enormous leap in firepower, with the average shooter being able to fire, reload, and fire 20 rounds in a minute, compared to two or three rounds per minute with standard muzzleloaders. In fact, the main complaint about these rifles was that they fired so quickly, the smoke made it difficult to see after a few shots. It could be quickly reloaded with an external magazine called the “Blakeslee Cartridge Box” and was the first magazine-fed infantry rifle put into service by any military in any country. This particular rifle was carried by Custer as he served with the 7th Cavalry during the Indian Wars. He even wrote about it in his autobiography, “My Life on the Plains.” “Leaping from my bed I grasped my trusty Spencer which was always at my side.” Although Custer was issued several different Spencer guns, it is believed that this was the one he used during the campaign of 1867 up to the infamous 1868 Battle of Washita River. 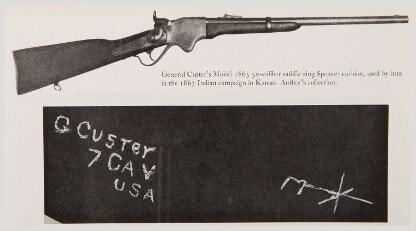 This rifle is pictured in Frost’s 1968 book “The Court-Martial of General George Armstrong Custer” as well as “Bugles, Banners and War Bonnets” by Ernest L. Reedstrom, both displaying Custer’s name engraved into the stock. The engraving is very worn and not particularly clear, but the condition of its patina dates it back to Custer. Custer’s Spencer disappeared for a short time after the family farm in Michigan—where it was being stored—caught fire in 1900. It was “saved” by someone who rescued it from a fiery death, but it was not returned to the Custer family. Instead, it was later discovered on display in another private collection of Custer artifacts a few miles away. After some negotiation, Frost purchased the Spencer which was identified by Custer’s nephew in an affidavit. From these excerpts it’s clear that for Custer, this was a beloved rife. If you’re interested in putting in a bid or just want to learn more about Custer’s Model 1865 Spencer Carbine, check out the auction page here. If you’re not interested in bidding on or learning more about Custer’s Spencer, then tell us, what’s your favorite Custer joke?